New Hieromartyr Tikhon, patriarch of Moscow and All Russia (1925) Wishing all a Blessed Feast on the Feast! rise up and rejoice at the harvest. who became Mother of the Lord of kings. of whose praise the heavens are full. and your arms which have held him. You have become a vehicle to bear a God of fire! you have become the home of the king. he who rules the world. You descended from the family of David. have become the mother of the Son of David. who have borne the lion cub spoken of by Jacob. destined to ascend the Cross to deliver us. which providing the kid, spared the life of Isaac. the curse of Eve has been destroyed. which has destroyed the reign of darkness. Live and archived services from this Feast can be found at St John the Baptist´s Cathedral in Washington DC and at from the Holy Land Orthodox Church in Beit Jala. 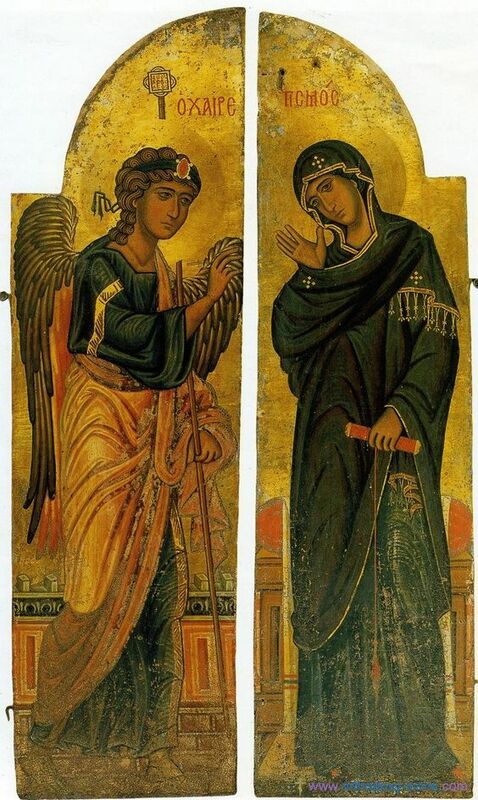 This entry was posted in 12 Great Feasts, Triduum Paschale and tagged 2019, Annunciation of the Virgin Mary, Orthodox Christian Liturgy, The Gospel/Goodnews. Bookmark the permalink.